In summer, weaker winds move the clouds more slowly. Heat absorbed by the city and pollution's interference with raindrop formation interact to cause the clouds to intensify before producing precipitation. 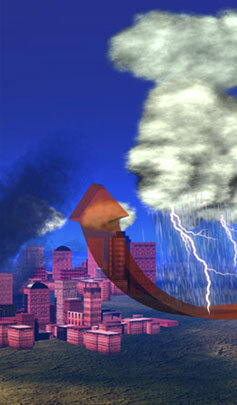 The onset of rainfall from a cloud leads eventually to its demise by cooling off the air near the ground. The air pollution delays the onset of precipitation, so that the intense storm clouds can build higher and larger before they start precipitating and subsequently dissipating. Recent studies suggest that rainfall patterns have changed in regions downwind of Houston from a period of pre-urban growth to a post-urban growth period. Other studies have observed areas of enhanced lightning flashes downwind of Houston. The Houston Environmental Aerosol Thunderstorm Project (HEAT) is designed to address the factors responsible for the observed enhancement in lightning frequency over Houston, TX. An array of surface and airborne equipment were operated during this study to characterize the thermodynamic, environmental, and cloud properties of the atmosphere within and outside of the urban area. It has been speculated that enhanced aerosol concentrations arising from urban emissions suppress precipitation and deepen the mixed layer within urban clouds, which may alter cloud electrification, and possibly increase lightning frequency. To address the merit of this hypothesis for the Houston region, detailed measurements of aerosol and cloud properties were necessary. Measurements were conducted onboard the SOAR research aircraft with complementary surface measurements of aerosol and cloud properties throughout the approximately 6-week intensive field program. Nearly identical instrumentation suites were used on the SOAR Cheyenne II and at the 275 m Williams Tower on the west side of Houston, to characterize size distributions, size-resolved hygroscopic growth, and cloud activation efficiency of the aerosol. The SOAR research aircraft was equipped with multiple wing probes for direct measurement of cloud droplet size distributions. The primary goal of the Houston Environmental Aerosol Thunderstorm (HEAT) project is to examine the sources and causes of a 50% enhancement of cloud-to-ground lightning discharges over Houston, Texas. Comparable lightning enhancement has been observed also over Lake Charles, Louisiana. Reaching this goal will involve quantification of the effects of pollution, the urban heat island, and the complex coastline on storms and lightning characteristics in the Houston area. Provide additional detail of the properties of the aerosol entering cloud base, and the size distribution of cloud droplets in the liquid phase region of target clouds. Through flights extending beyond the Houston urban area, statistically characterize the differences between CCN spectra within and outside of Houston. Provide a link with the ground-based measurements by flying spirals over the surface site. Airborne measurements from the SOAR research aircraft provided the necessary spatial coverage of the study region as well as the direct in situ measurements of cloud properties. To assess the degree to which the aerosol and CCN properties during flight times are representative of the region, complementary measurements were made continuously at the surface site at the 275 m Williams Tower on the west side of Houston. A room on the 59th floor of that building was used for sampling during this campaign. A ground-based version of the DMA/TDMA system operated on board the Cheyenne was used to characterize submicron aerosol size distributions and size-resolved hygroscopic growth. The size distribution of supermicron particles was measured using a TSI, Inc. Model 3321 Aerodynamic Particle Sizer (APS). Direct measurements of CCN concentration at a single supersaturation were measured with the same model DMT counter as that used on board the Cheyenne. Whereas the TDMA and CCN counter were operated in parallel on the Cheyenne to maximize time resolution, they were intermittently operated in series at the surface site to examine the relationship between particle size, hygroscopic behavior, and activation efficiency.